Two years ago, I called Pistons center Andre Drummond a hilarious monster, and it was a fitting description. He was player blessed with the strength and cunning to grab 13.8 rebounds a game (4.3 of them on the offensive glass), and the rock-handed touch to shoot 38.6 percent from the free-throw line. He’s still very much a monster, but now he’s more frightening than hilarious. Drummond left Boston last night with bits of the Celtics stuck in his teeth. He led the Pistons to a 118-108 victory by scoring 26 points on 10-12 shooting, grabbing 22 rebounds, and dishing six assists. Perhaps most impressively, and in keeping with this year’s startling trend of decent free-throw shooting, Drummond went 6-8 from the line. Drummond’s free-throw shooting, which has improved by 23 percent over last season, is the most notable improvement to his game, but he’s come a long way in other areas, too. He’s always been excellent at snatching rebounds and (eventually) spiking the ball into the basket at close range, but he’s never been much of an operator in the low post. Last season, he posted up 6.9 times per game and only scored 0.73 points per possession, putting him in the 19th percentile of the league, according to NBA.com. This year, he’s hardly posting up at all—just 2.4 times per game—and is saving the Pistons a lot of wasted possessions. 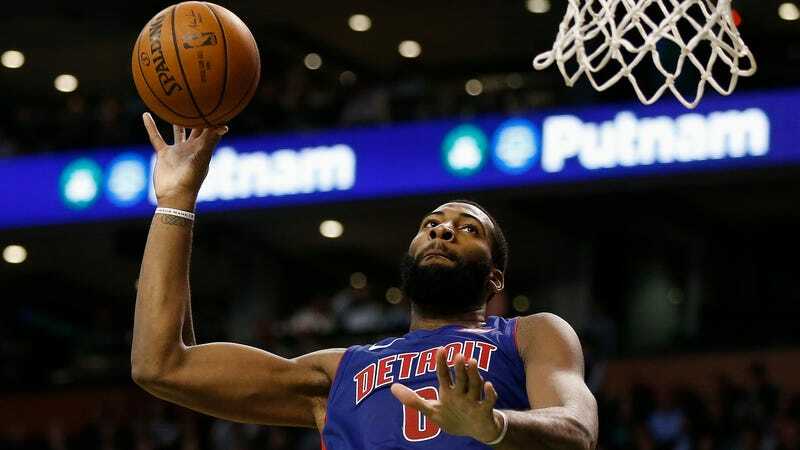 Instead of trying to force himself to be a deft low-post scorer, Drummond has pulled himself out to the elbow, from where he is often running the Pistons’ offense. Drummond had just 2.5 elbow touches per game last season, and this year that number is all the way up to 6.8, according to NBA.com. He’s making things happen with those touches, too. He passes out of the elbow 70 percent of the time, and 10 percent of those touches end with him getting an assist. Drummond has averaged over one assist per game just once in his career; this season he’s averaging 3.5 per game. It’s a simple play, but it’s a deadly one. Aron Baynes has to leave the lane wide open for Reggie Jackson in order to check Drummond at the rim, which leads to an easy floater. And even if Jackson misses that shot, Drummond still has good position and will be able to give Baynes a real fight for the rebound. If you had asked me a year ago which starting NBA center would be least likely to make a pass like that, Drummond would have been near the top of the list. If these transformations in Drummond’s game seem surprising it’s only because he’s already logged five years in the NBA. But he’s just 24, and and is proving that he’s still capable of evolving as a player. He’s looking less and less like a one-trick center that never seemed destined for true stardom, and the 13-6 Pistons have to be very thankful for that. How The Heck Did The Pistons Beat The Clippers And Warriors?